On Thursday, June 18th, America Forward hosted a Congressional Briefing on Pay for Success entitled Pay for Success: Federal Policy Opportunities to Advance Outcomes-Based Practice. 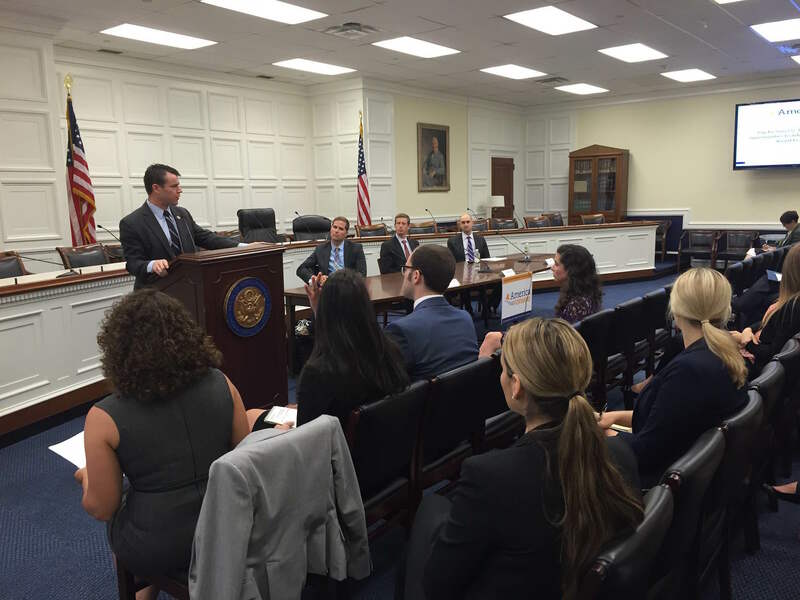 Co-sponsored by Representatives Todd Young (R-IN) and John Delaney (D-MD), the event included over 60 Pay for Success experts, advocates, and those interested in learning more, including a number of Hill staffers. We were honored to have both Representative Young and Representative Delaney speak at the briefing. As leading Congressional voices on Pay for Success, Representative Young and Representative Delaney are steeped in the topic and are looking for various ways to advance the federal government’s role in initiating, replicating, and expanding innovative Pay for Success arrangements. At the briefing, both Congressmen spoke of the possibility and promise of Pay for Success to measurably improve lives and communities, to encourage innovation in how government services are provided, and to more effectively use taxpayer dollars. In addition to the members of Congress, America Forward Coalition members Third Sector Capital Partners (TSCP) and Social Finance, as well as the Policy Innovation Lab at the University of Utah played an important role at the Briefing by providing an overview of Pay for Success and sharing examples of current and pending Pay for Success projects in an effort to describe the approach as it works in practice. Specifically, Brian Beachkofski from TSCP, Jeff Shumway from Social Finance, and Jeremy Keele from the Policy Innovation Lab were able to illustrate Pay for Success effectively for the audience and make clear through their examples of Pay for Success on the ground the connection to federal policy and funding, and thus the importance of federal legislation, such as the pending Social Impact Partnership Act, to advance Pay for Success. The briefing concluded with America Forward’s Government Affairs Director, Nicole Truhe, providing a high level overview of the Social Impact Partnership Act, its importance in supporting the development and scaling of Pay for Success, and an update on where the legislation is in process in both the Senate and House. The caliber of questions asked by those in attendance, as noted by many attendees, showed the increasing level of interest and knowledge of Pay for Success. The dialogue was helpful in advancing not only the concept of Pay for Success, but in bringing awareness to and understanding of the important role of federal legislation in advancing Pay for Success across the country. Learn more about America Forward’s work on Pay for Success here.